Cats are of a much more independent nature than dogs, and are therefore far less prone to separation anxiety. However, their fickle nature makes this problem an ever present threat that can be triggered with very little warning. To make matters worse, cats rarely exhibit the symptoms as obviously as dogs will. When a cat is upset it will do any number of things to relieve stress. To keep kitty from suffering, here are some of the top symptoms and solutions for separation anxiety in cats. Excessive leg rubbing or clawing- While most cats are affectionate, there is usually a limit. 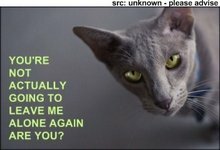 If your cat insistently passes its daily allotment of rubbing every time you walk in the door, or likes to greet you with a scratch, you might have a problem. Shadowing and Blockading- If your cat is following you from room to room, or trying to stand between you and the front door, he or she probably doesn’t want you to go too far. OCD cleaning- Cats keep clean with daily grooming. However, if your cat is grooming to such an extent that it’s losing fur, then separation anxiety is a definite possibility. Ignoring the litter box- Cats know exactly where they should go, but depending on their attitude towards you they may just choose to do their business on the bed. This is not a sign of a contented kitty cat. Chewing, scratching, or biting- If your cat begins to have a problem keeping its destructive impulses confined to the scratching post, they may be suffering from separation anxiety. Loss of appetite or nausea- nervousness and anxiety can cause your cat to eschew its food and even retch. Be on the lookout for this unfortunate behavior. Cats, as always, end up being a little more complicated than dogs. As such the tricks you’ll have to use to keep your kitty behaving while you’re gone are a bit more complex as well. All of these should be repeated 10 to 50 times in a clear line of sight for the cat. 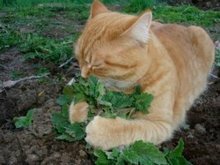 Use catnip- Toss some in your suitcase so the cat correlates the bag with fun rather than you leaving, or leave some on the ground when you leave to keep kitty busy. Leave harp music on the radio. Apparently, harp music is shown to have a soothing effect on felines. Who’d have thought? Toys- Just like dogs, cats can be easily distracted. Apply these cat tactics, and the anxiety problems should cease fairly quickly. But if your cat’s behavioral problems persist, it is advisable to consult your vet for further professional council.